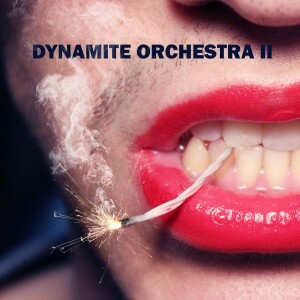 It is with great pleasure and excitement that I welcome back DYNAMITE ORCHESTA. For those of you keeping track, DYNAMITE ORCHESTRA has been featured in my “Song of the Week” column twice before, under their former band name Slaves and Martyrs, with their songs “Searching For Love (In The Wrong Place)” and “Black Haired Beauty”. What I love most about this local rock/pop duo is their willingness to make bold choices— from song topics to background vocal arrangements, there is absolutely nothing “status quo” about this band or their music. While a plethora of influences can be detected throughout each of their songs, DYNAMITE ORCHESTRA creates a distinct sound and mood that beckons the listener into their unique, unexpected world. “SAPPHIRA” is hauntingly seductive, reminiscent of a refined striptease that a character from Rocky Horror Picture Show may partake in as the rest of the cast performs understated Fosse choreography just outside of the spotlight’s illumination (see how specific and strong the visual effect of their sound can be?!). Grab “SAPPHIRA”, along with the rest of their new EP (titled “DYNAMITE ORCHESTRA II”) on iTunes, Amazon, and Spotify now. Q: What was your inspiration for writing “SAPPHIRA”? ALFI ALVAREZ of DYNAMITE ORCHESTRA: Back in 2011 as I was studying in Boston, I saw a drag queen perform at a club. Her name was Sapphira Cristal. She was hysterical and very talented. It was always an idea to write a song about a drag queen. We are still friends and many times we’ll have drag queens at our shows to make things more of a spectacle! Q: What’s your favorite lyric from “SAPPHIRA”? Q: Describe DYNAMITE ORCHESTRA in a five word phrase. ALFI ALVAREZ: A band long past due. ALFI ALVAREZ: We’ve gotten more modern since our last album. We mixed both live and synthetic instruments along with different synths to make it a little more colorful and all-around fun. ALFI ALVAREZ: We love just hanging out in our studio and throwing up ideas for shows and songs. ALFI ALVAREZ: We are planning out our calendar at the moment. Follow us on Facebook or Instagram to find out. ALFI ALVAREZ: “Tango ’Til We Drop” from our new EP— mainly because it’s a tango and no one expects it, and the reaction is great. Folks actually begin to dance! ALFI ALVAREZ: we want to work on some big show ideas and get to work on a rock opera concept album. ALFI ALVAREZ: Blizzard. There’s nothing like being snowed in with a good drink, isolated from the world for a bit. Check out DYNAMITE ORCHESTRA on Facebook and Instagram, and grab “SAPPHIRA” (along with their new album) on iTunes. Madysin Hatter is a Singer/Songwriter/ROCKER. Have a song you’d like to have featured? Visit www.MadysinHatter.com to submit.